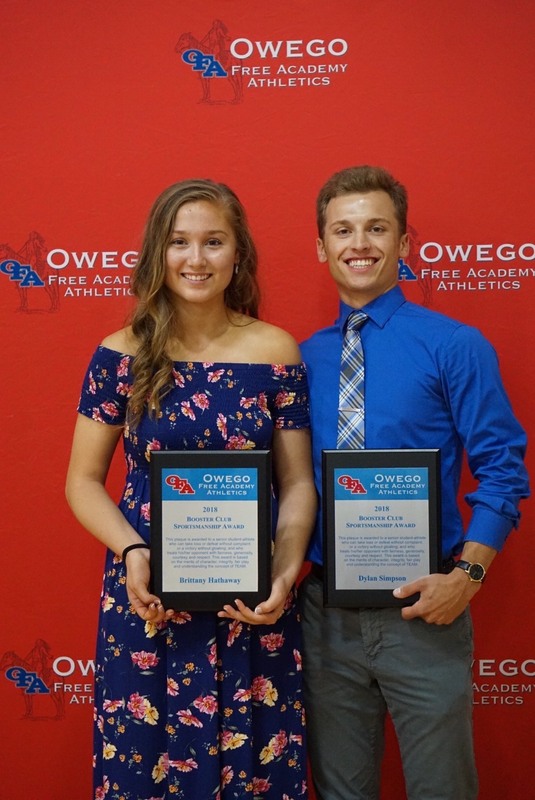 Congratulations to Dylan Simpson and Brittany Hathaway on being awarded the OFA Sports Booster Club’s Sportsmanship Scholarship Award! This award is based on the merits of character, integrity, fair play and understanding the concept of TEAM. Good luck to both students and they continue on to college. To cultivate and promote community involvement in, and support of, athletic programs within the Owego Apalachin Central School District; to recognize student athlete accomplishments; to encourage greater participation by the student body, cooperating with and supporting existing district standards. Meetings: The schedule for meetings will be listed on ScheduleGalaxy (located on the Athletics main page). Location for the meetings is the Owego Free Academy library, which is just off the main lobby in the high school. Who can attend? : Anyone in our district who wants to volunteer their time to create opportunities for our student-athletes and teams. Scholarship Fund: Each year a graduating male athlete and female athlete are recognized for their sportsmanship and awarded a scholarship in the amount of $500. Also, each year we name one male and one female athlete of the year. Senior Banquet: Each year the OA Sports Booster Club holds a banquet to recognize and honor the athletic accomplishments of our senior student-athletes. This is held at the end of the school year. Annual Sports Dinner Auction: This fundraiser provides an opportunity for each individual sport to raise money for their respective Booster Club account and for the Booster Club general fund.